Bronze and brass watches have been popping up with some frequency over the past couple of years, and for good reason. These alloys have an attractive color which varies depending on the amount of copper in the alloy, and on the particular pattern and color of its patina as the metal oxidizes over time. Because these materials were common fittings on steam engines and sailing ships, they bring a certain 19th century charm to a 21st century product. 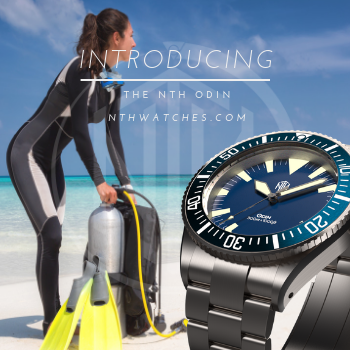 Perhaps because of the nautical association, most have been chunky tool watches, from massive Panerai and Anonimo bronzos, to traditional divers from Armida and Helson, to burly steam punk creations like the Berkbinder & Brown. 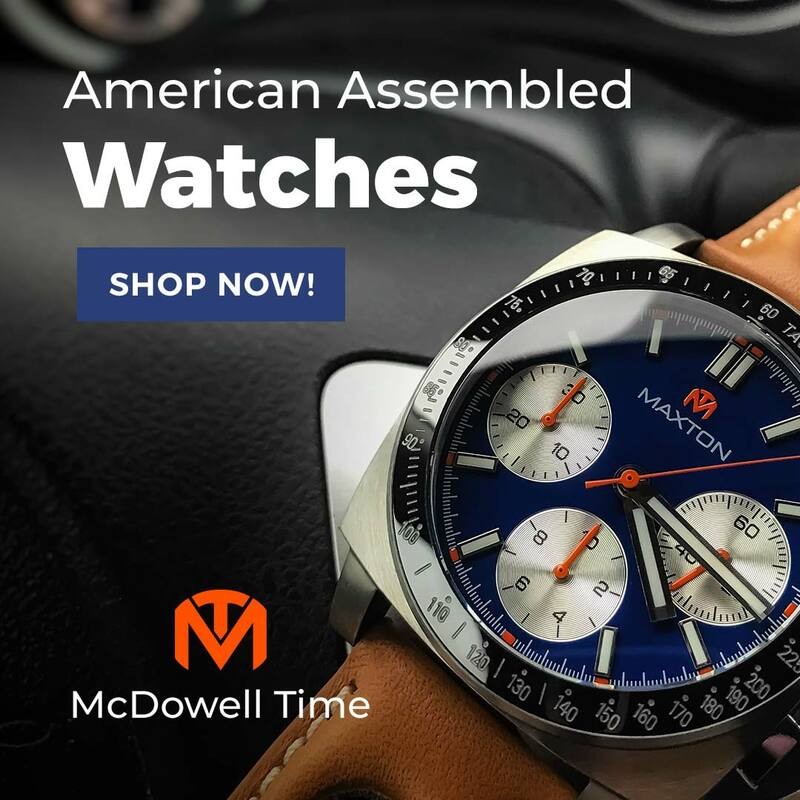 These are amazing watches, but I have often wished I had one that was smaller and more subdued so I could fit it under a cuff and wear it to the office. Maybe a bronze diver you could dress up and take out. A bel bronzo, if you will. 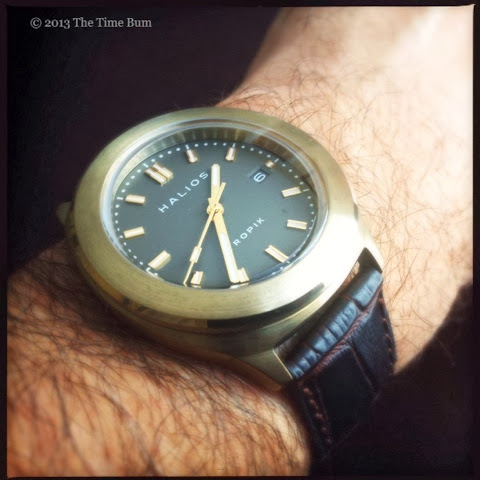 Clearly, I was not the only one, because this is exactly what Halios Watches of Vancouver, British Colombia has delivered with the Tropik B: a high quality automatic in an understated bronze case that is still capable of a 300m dive. Powering the Tropik is a Miyota 9015, a 24 jewel, hacking, hand winding automatic with a 48 hour power reserve, ticking away at a smooth 28.8k beats per minute. While it would have been nice to view the movement through the case back, that would have likely compromised water resistance. As it is, the engine is secreted away inside the case, and what a case it is. Unlike most bronze watches, which are made from an alloy of copper and tin, the Tropik B is composed of an alloy of copper and aluminum. 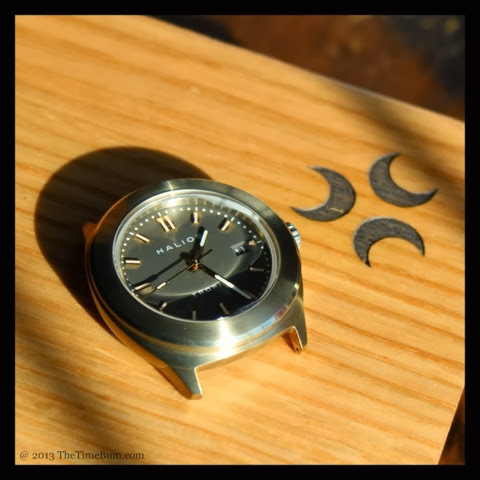 This aluminum bronze is lighter in color and more resistant to oxidation and corrosion than other bronze alloys, although it will develop a brown patina in time, as evidenced by the prototype photographs on the Halios site. All surfaces are brushed save for a polished ring on the outer beveled edge of the thick and otherwise unadorned bezel. It is an elegant detail, the first of many you will notice on this watch. At 41mm in diameter, the Tropik B is smaller than most its rivals, but given its 14mm height, no one will mistake it for a dress watch. A small, thick case could easily appear squat, but every line has been drawn to avoid this undesirable result. The upper surface of the case is slightly domed, falling away to the edges of the bowl shaped body. The lugs are also curved and taper inward. 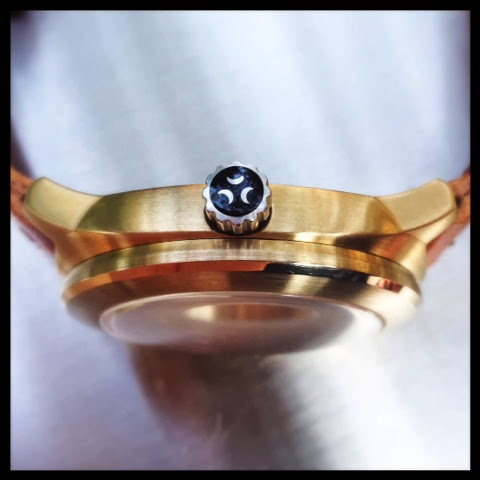 The rounded elements continue with a radiused bezel and slightly domed sapphire crystal. While the overall dimensions give it some reassuring visual heft, the network of intersecting arcs create a surprisingly graceful appearance. The screw down crown sits at 3:00. 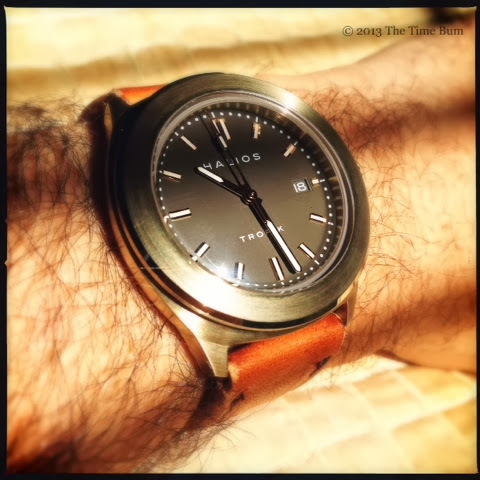 It is deeply grooved, easy to grasp, and decorated with the Halios triple crescent logo. It is fashioned from stainless steel, as is the engraved case back, which bears the image of Capricorn (perhaps as in the Tropic of?). The dial is similarly complex and detailed, beginning with the choice of color. 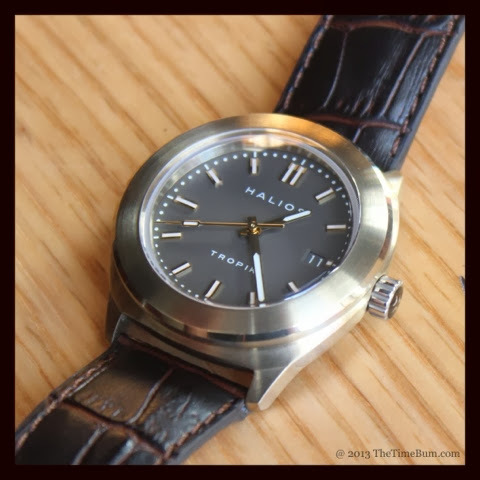 Halios went for subtle, muted shades of Olive Green, Granite Grey, and Tobacco Brown. Mine is brown, a soft, cool tone that leans more towards a darker shade of taupe and appears grey in certain light. It is also, incidentally, the only color still available, grey and green having long since sold out. The layout is clean and modern with bar shaped, applied indices in a polished gold tone, an element repeated in the index hands and rectangle-tipped second hand. 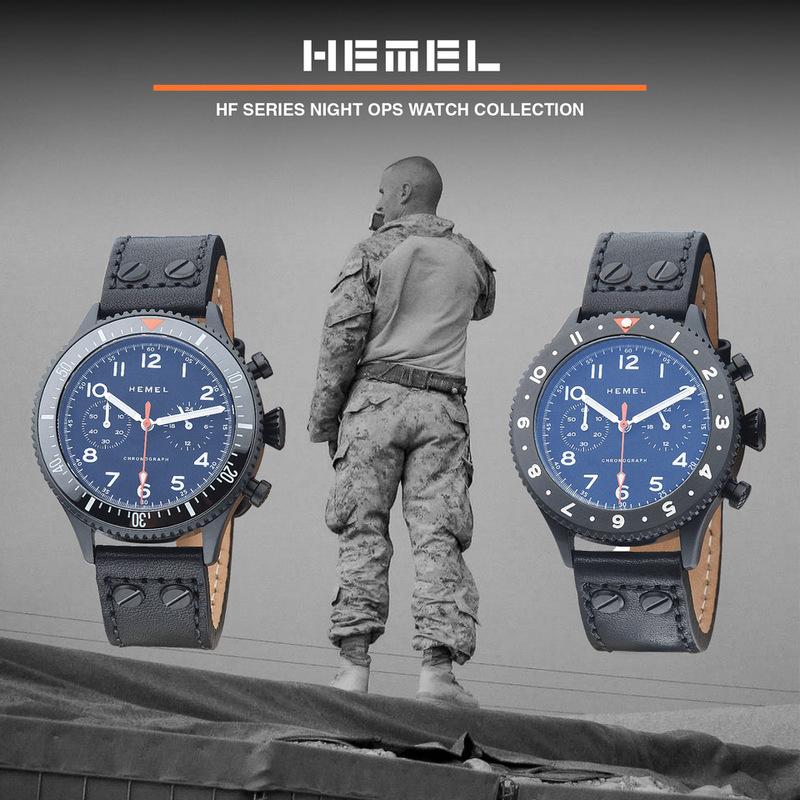 All are treated with Superluminova for a strong blue glow. Text is printed in white and limited to "Halios" in the upper half, and "Tropik" in the lower, both printed in an attractive sans-serif typeface. There is a color matched date window at 3:00, with white text on a brown background. There is nothing jarring, extraneous, or out of place on this dial. Everything is harmonious. Everything is legible. Everything works. 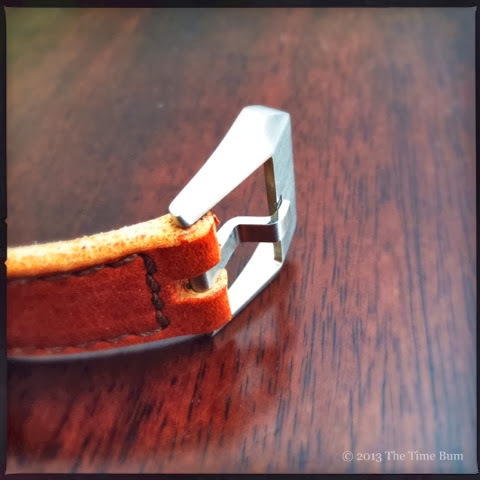 The supplied strap is handmade of Horween leather and leans heavily to the tool aspect of the watch. It is a rugged piece, straight-cut, and thick. 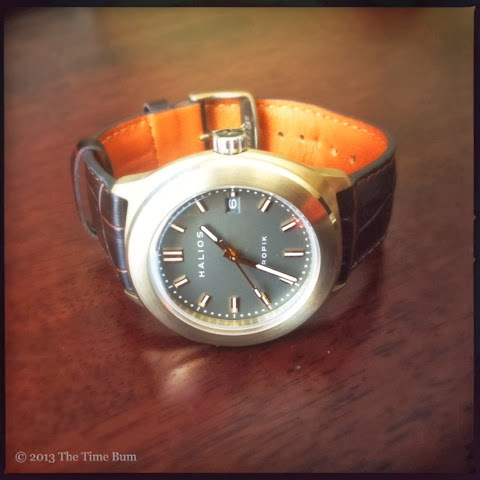 The orange-tan leather and brown stitching is a good complement to the golden case and brown dial. 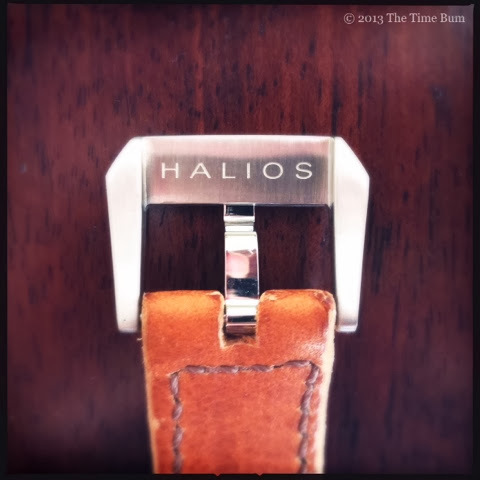 It is secured with a sturdy and attractive buckle, engraved with the Halios brand on the inside. While it looks great on its own, it is not the ideal match for the watch. First, it is distinctly angular, which fights the soft lines of the watch head. Second, it is stainless steel, not bronze. This was the result of a production delay, and new bronze buckles will be shipped to buyers as soon as they are available. 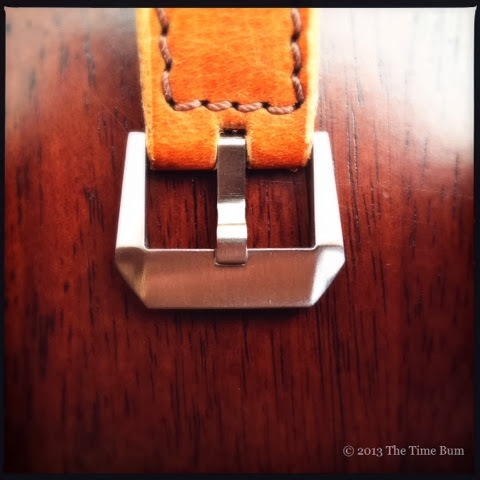 As nice as the stock strap may be, it did not fit my concept of the bel bronzo. Something slightly more polished was necessary if I were to wear this watch with a suit and tie. 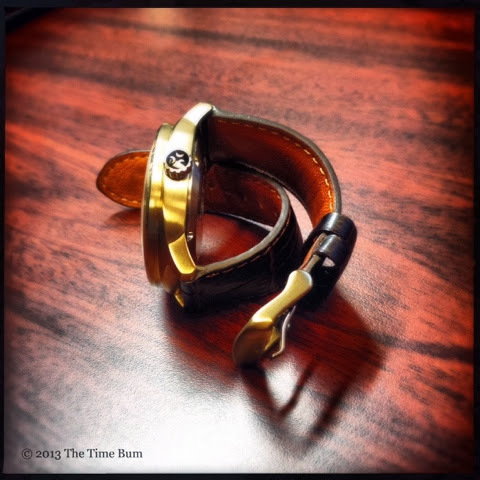 I wanted a strap that was tailored, padded, and tapered to 20mm. 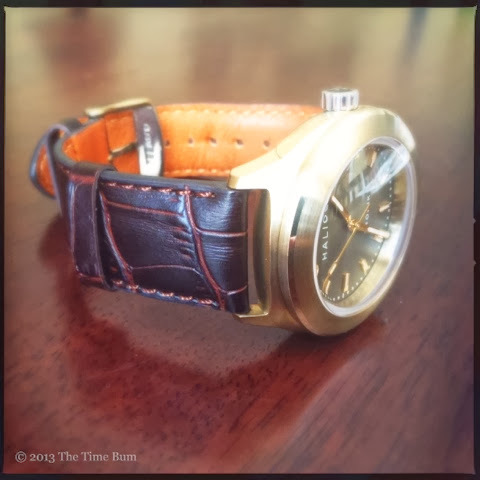 A trip to the strap drawer yielded a Crown & Buckle Brown Gator, an embossed, matte finish, calf skin strap in dark brown with a hint of burgundy that complements the cool tones of the dial and case. 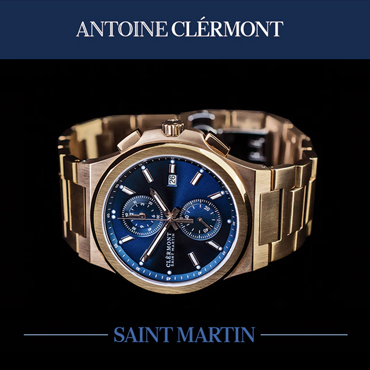 It is an attractive pairing that plays into the polished details and dresses up the watch without being too fussy. The buckle proved to be a bit of a challenge. A rounded frame, flat prong, 22mm bronze from Olivier Watch Company worked well on the supplied strap, but I could not track down anyone who supplied a 20mm, let alone one in a traditional style. I solved this problem by heating a stainless steel buckle until it turned the right golden tone. Finally, I must describe the box it came in. I never discuss packaging in my reviews because frankly, I don't care. I have no use for an empty watch box. It just gets tucked into a closet. This one, however, is special. It is wooden, properly finished, and fitted with cell foam cut to hold the watch, an extra strap, and the complimentary strap tool. The Halios logo is burned into a corner on the hinged lid. Like everything about the Tropik B, the box displays a sophisticated design sensibility, and attention to detail that elevates it beyond your expectations. Yes, even the box. The Halios Tropik B sells for $675 plus shipping, which is not cheap, but it is quite reasonableconsidering its specifications, quality, and design. Only 100 units of each color were produced in the initial run. Two of the three colors are already sold out and there is no word if a second batch will be produced. 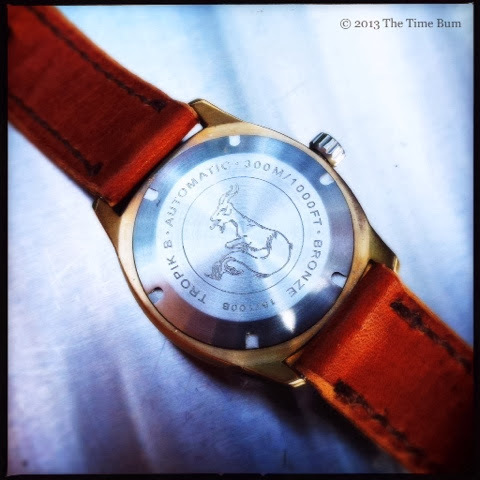 This is not a watch you will see very often, and if you don't act soon, you may not get another chance. Pro: Dive capable, drop-dead gorgeous. Con: Only one color choice left. Supplied strap Is a tad rustic. 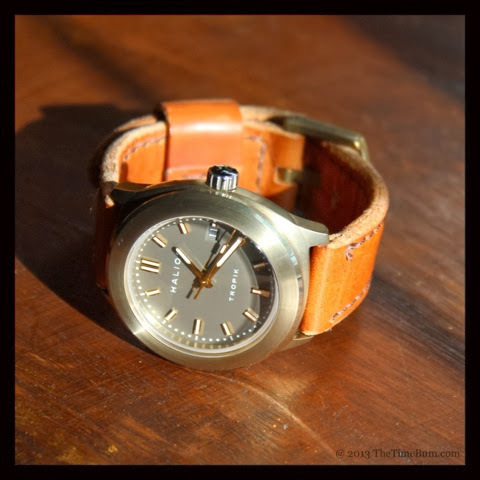 Sum: A tough and sophisticated watch that is unique among bronzos.